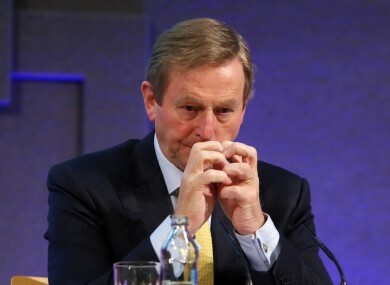 FINE GAEL HAS dropped five points to 24% in the latest opinion poll. When the ‘don’t knows’ are excluded, the senior government party is now just one point ahead of Fianna Fáil, which remains unchanged at 23% in the Sunday Independent/Millward Brown poll. Voters seem to be moving away from Fine Gael due to anger over a number of Irish Water controversies and the banking inquiry. Coalition partner Labour is up a point to 7%, Sinn Féin remains unchanged at 21% and support for independents and others is up four points to 24%. The Socialist Party is on 2% and People Before Profit, the Green Party and Renua Ireland are all on 1%. The country’s newest party, the Social Democrats, has 0.5%. Fianna Fáil’s Micheál Martin is the favourite party leader on 32%, Sinn Fein’s Gerry Adams is next on 30%, Taosieach Enda Kenny is down seven points on 25%, Tánaiste Joan Burton is down six points to 20%, while Renua leader Lucinda Creighton is down five points to 16%. Satisfaction with the government dropped four points to 25%, but 27% of those surveyed feel the current government will be returned to power. The survey os 976 people was taken between 19 and 30 July – around the time Irish Water failed the crucial Eurostat test. In the same poll, 36% of people said they thought water charges would be abolished, while 37% said they would be fully implemented. Email “The latest poll is out - and it's bad news for Enda”. Feedback on “The latest poll is out - and it's bad news for Enda”.